Doing a lot of character studies, it occurred to me recently that I have never did one on Jesus. I have read through the Gospels, but never actually focused on the character of Christ. So, I took on the challenge only to realize that it was four books to go through, each presenting our Lord in a different way. Needless to say, I am only about halfway through Matthew and there is already an overwhelming amount of the character of Jesus that I can pick out and desire to imitate like no other person in Scripture that I have studied. There are plenty of books and literature on the person of Jesus Christ, and this post is in no way meant to summarize who Jesus was, rather what I gleaned from one chapter. One of the things I love most is the genuine emotion of Christ, lead by his focused mission. He was intentional with everything he said and did; he was intentional in where he went, when he went, and when he left, yet, he was far from one-dimensional, which is what we see in Matthew 14. In this chapter is the famed story of the feeding of the five thousand, but it is before the fish and loaves that brings an extra dynamic. Jesus had been ministering for some time to the people and interacting with the Pharisees and scribes, healing, teaching, confronting, and all that jazz when there is a shift of attention. At this point, John the Baptist, Jesus’ cousin was locked up, which we learn in chapter 11, and because John confronted Herod about his relationship with his sister-in-law, Herod wanted him dead, but it was his sister-in-law who actually saw his death come to pass. Jesus found out. Considering who John was to Jesus by family and in ministry, we can only imagine how devastated Jesus was when he was told what happened to his cousin. To grieve, Jesus got on a boat privately and went to be by himself. Nevertheless, he had compassion on the people who followed him to wherever he was going. Let’s pause here and think about this. If you had just lost a close family member within a day’s time, it’s not weird for you to want to get by yourself to process the situation and cry, and the last thing you want is for a whole bunch of people to come around you who only want something from you or want you to do something for them, especially if they knew what had happened, you would consider them inconsiderate jerks. Now we don’t know for sure if the people knew Jesus’ cousin had just died, but it is very possible at least some of them did, but perhaps they saw Jesus as a superhero who doesn’t have vulnerable moments, so they didn’t really think anything of taking advantage of Jesus being alone. Perhaps, that is why Jesus showed compassion. I have heard it in a similar fashion before, but ministering counts most when you don’t want to; it matters most when you have to go out of your way. If I was in a similar situation, I would have cussed them out in my mind and turned right back around in my boat and went somewhere no one could find me, or I would have told them straight up to get away from me and come back later when I felt like being bothered. But by God’s grace, Jesus is not me or you and that is not what he did. He put himself on the back burner and showed love at its finest. We see the precious humility and grace of our Lord so much in so that he stayed with them for hours that same day and his compassion and selflessness led to one Jesus’ greatest miracle, the feeding of the 15,000. As an encouragement to us, the more we take ourselves out of it, the more miracles we can witness, and we can trust that God will allow us the time we need to breathe and regroup with Him, for it was after the miracle that Jesus took the opportunity to get away and spend time in the presence of God in prayer. How awesome is it that Jesus knew he needed supernatural strength to continue his journey. He was fully human and wise enough to know he needed fellowship with his Father. Likewise, God knows what we need and when we need it, even if we need time and space to be alone, as did Jesus, and sometimes He knows it before we do and creates a situation that forces us to get by ourselves. Thus, we must trust that He doesn’t play with our heart and with our emotions, and when we are obedient, He makes sure we get Heaven’s best, refreshed and renewed to continue being ourselves for His purpose. At the closing of the chapter, we see another famed account as the day continued. 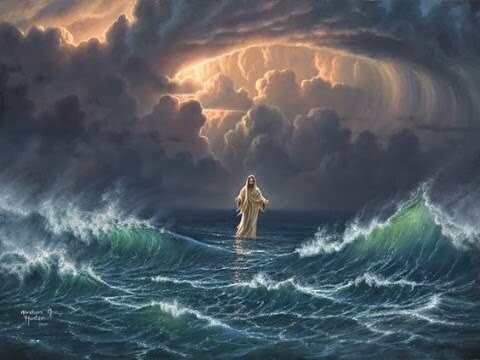 After Jesus received what he needed at the mountainside, he went to be with the disciples, but they were too far off in rocky waters, so he decided to go out and meet them by walking on the water. Something special happens when you meet with God, things start happening that you have to step back and people will be wondering what is going on, as did the disciples, and all you will be able to say is, “to God be the glory.” It is then we see the power of the God in us, because in verse 32 we read that as soon as Jesus got in the boat, the winds stopped. He didn’t say a word, they just stopped. The disciples neither mentioned it nor asked Jesus to calm them like he did in chapter 8. Still, when Jesus got in, the winds stopped. How incredible is that? If you are like me, there are times that you really don’t want to be bothered, whether you have a good reason or not, but it’s in chapter 14 we see the heart of our Lord as an example of choosing to love people and put their needs above our own with God’s wisdom and discernment. The more we show God’s love, the more miracles we can be a part of and experience.